Centric Parts, a division of APC Automotive Technologies, has launched a new promotion that enables professional technicians to try its next-generation PQ PRO brake pads, free of charge. The PQ PRO “Experience the Best” promotion runs from April 1-May 31. 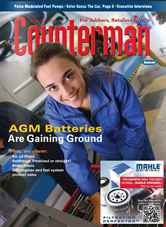 The PQ PRO promotion is open to all qualified professional automotive technicians. To participate, technicians need to register and sign up on the PQ PRO “Experience the Best” website. Participants will be required to identify the top three vehicles that their shop services most frequently. Centric Parts will select one of the vehicles and send the technician a matching, applicated set of PQ PRO pads, free of charge, beginning in early June. With application coverage for more than 900 SKUs, PQ PRO brake pads from Centric Parts require no break-in, meaning less time is spent on each brake job. According to the company, PQ PRO pads feature an exclusive Mu500 coating for immediate stopping power, and they don’t produce dust or noise, resulting in fewer come backs.PQ PRO brake pads are compatible with coated and uncoated rotors and have been engineered to match or exceed original performance specifications, according to the company. Each set of PQ PRO brake pads features the Centric Parts One-Year Assured Roadside Assistance Guarantee, which offers consumers one year of roadside assistance up to a cost of $100. 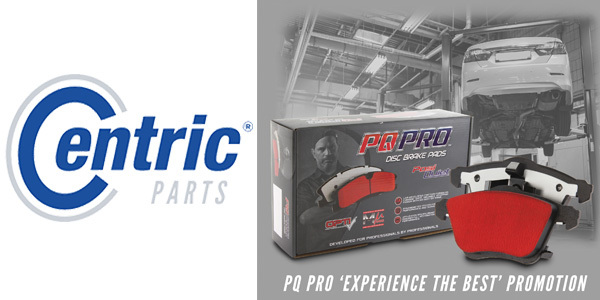 In addition to receiving a free set of PQ PRO brake pads, technicians who complete a pre-/post-trial feedback form will be entered to win a $100 e-gift card to the Centric Parts online apparel and promotional store.